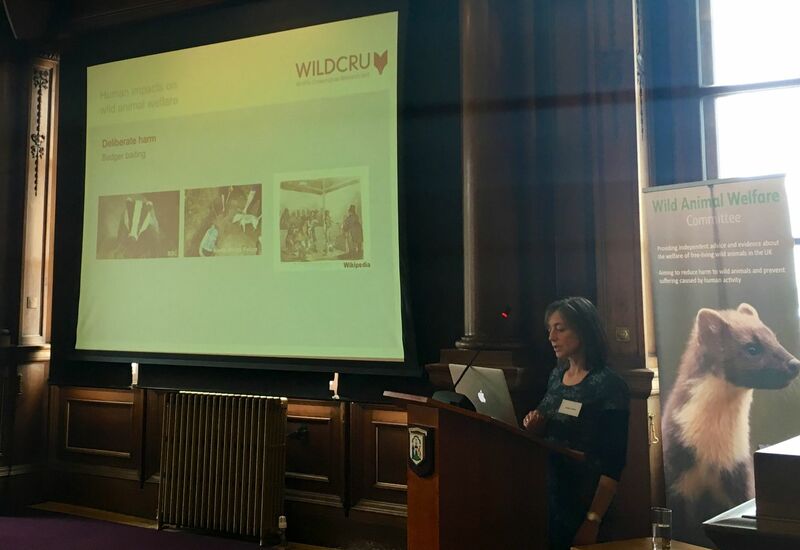 WildCRU’s Dr Sandra Baker spoke at the Wild Animal Welfare Committee conference in Edinburgh on 27th March. The conference theme was Who are the guardians of wild animal welfare? In her presentation, Sandra revealed surprising gaps and inconsistencies in the UK trapping legislation and presented three case studies on how human behaviour might be influenced to improve wild animal welfare in wildlife management, without further regulation. The first demonstrated how pressure by the Humane Society International-UK, and by members of the public, was able to persuade >215 major stockists of rodent glue-traps to stop selling these devices to the public, who are unlikely to know how – or be able – to kill a glue-trapped rodent humanely. The second case study detailed Sandra’s proposed Voluntary Trap Approval scheme for rodent break-back traps, which are currently unregulated (unlike other spring traps in the UK); the aim is to encourage manufacturers to make, and to allow customers to choose, more humane break-back traps, and to end the double standards in UK spring trapping. The third case study related to a new Europe-based enterprise – the NoCheRo Working Group – led by the German Environment Agency (and of which Sandra is a member) to prepare the ground for non-chemical alternatives – such as properly assessed traps and suitable trapping systems – to be regarded as serious alternatives to biocidal products, the aim being to prevent anti-coagulant rodenticides from being reapproved by the EU in 2024.